SeedboxBay is one of the cheapest yet reliable seedbox providers you can find. Seedbox Guide has been reviewing the “Baby Plan” which is a 100GB disk space, a 1Gbps download connection with an unlimited bandwidth. Other Seedbox plans they offer are available here: SeedboxBay plans. Downloading with an average speed of 1.4 Mbps is not really that bad especially when torrent files don’t have enough seeders and leechers. Uploading is less appreciated as it only went up to an average of 350 kbps. Though tracker-factors are considered, I believe this speed increases and will almost meet up the top speed promised of 1Gbps. 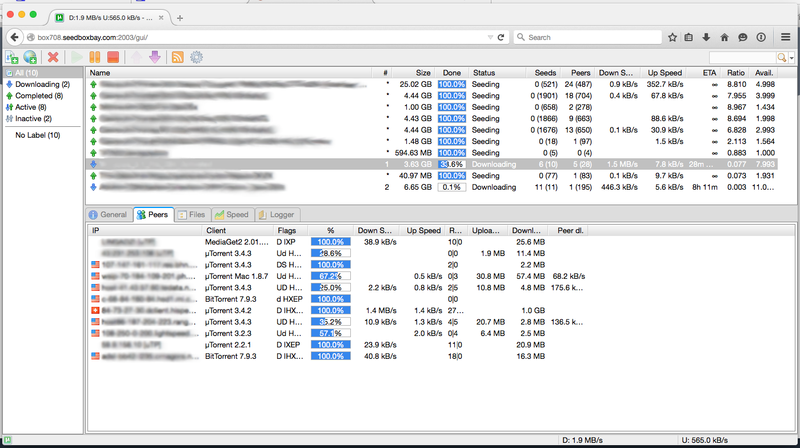 Shown below is an example of SeedboxBay’s performance using uTorrent web user interface. Upon ordering for a plan, they responded quickly within the day and gave the detail of login credentials thru email. It also contains the links to support team when needed. After few hours of testing our seedbox, I had to send a ticket inquiring about the speed. It can be less relevance but the client response came after few hours. SeedboxBay’s support team responded with my inquiry. I found the support friendly and answers clearly. I can say that their customer support system is reliable and can be trusted to help out any torrenting problems. Another good thing that SeedboxBay offers is a 72-hour money back guarantee. Go try their product and services. Once not satisfied, you can always as for a full refund within 72 hours. So far they keep their promise of having a rich web interface of their utorrent client. It is installed by default and used it with ease. Though deluge is preferred, the simplicity of utorrent is beneficial to users. SeedboxBay prepares readily their knowledge-base page for their clients.